The advance of regret can be so gradual that it is impossible to say, ‘Yesterday I was happy, today I am not.’ At no one moment did Lilia realize that her marriage was a failure; yet during the summer and autumn she became as unhappy as it was possible for her nature to be. She had no unkind treatment, and few unkind words, from her husband. He simply left her alone. As an introduction to the writing of E. M. Forster I do not think I could have done better. After all, this novel marked his own debut and as such, here the reader witnesses his first attempts to construct a subtle and gripping narrative of social mores. However, for the majority of the book I was confused. Was Forster satirising these English toffs abroad, or did he in fact approve of their condescending snobbery? 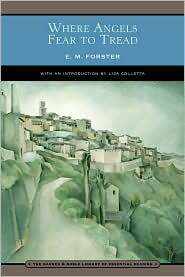 It was only after the book’s conclusion that I realized just what Forster had achieved – a genuine work of compassion, unrestrained in its perspective on human weakness. When recently widowed, yet worryingly vivacious, Lilia Herriton agrees to travel to Italy to go on an extended tour of the sites, the in-laws breathe a sigh of relief. The attentions of certain suitors of the young woman raised the spectre of a scandal, which they could not abide, and they trust in the efforts of her companion Caroline Abbott to be a champerone in her travels. The Herritons calm is disrupted when a letter is received from Lilia informing the family that she had made a new match with a native of the Italian town of Monteriano. The youngest Herriton son Philip is sent to recover the family’s honour only to discover that it is too late. Lilia has already married Signor Gino Carella. The news could not be worse. Not only has the young widow and mother left her child behind in England, with no apparent interest in returning, she has chosen to marry the wastrel son of the town dentist. Philip is humiliated by the encounter with the couple, his plan to pay off the Italian foundering when Gino realizes staying with Lilia is far more profitable. He also blames himself for the entire situation. After all, had he not been the one to first sing the praises of the Italian countryside and the mercurial character of its people? Had he not encouraged Lilia to go on her tour, filling her head with ideas of high culture and art – romance, the thing he yearns for the most? Philip leaves Italy disenchanted, embracing the cynicism of his mother, while Lilia is left to her domestic life with Gino which soon begins to lose its charms. By finally defeating her upper-class and superior in-laws has she only managed to strand herself in a country estranged from everything she knows? At one point Caroline Abbott accuses Philip of been unable to take a stance on anything – he insists on sharing everyone’s point of view. It is a critical moment in this book as it reflects Forster’s own stance on human nature, weak, fallen, lovable, hateful and doomed all at once. Apparently the narrative itself was inspired by a disastrous trip across Europe that the young man shared with his mother, with much moaning and complaining about migraines and bad food. That privileged perspective on Europe, the site of many an upper-class aristo’s ‘tour’, persists but there remains a genuine sympathy for these characters, enriching the material throughout. Gino in particular seems to be the archetypal spoiled brat, using a callow rich woman for her wealth, but Forster shows that the boy-man has his own charms and needs. Lilia is tragic in her desire to still live up to the standards of the Herritons even after she has finally escaped from them, while Philip’s wish to be an aesthete, indulging himself in high-falluting talk about civilization and Old Europe comes undone when confronted with the pain of real life. This is a wonderfully judged and subtle work, a remarkable achievement for a first novel.